U.S. stock futures are now lower, as Dow futures tumble after Dow component MMM reported a miss on the top and bottom line and drastically cut its outlook for the year (sending shares down over 7%). Overnight however, tech stocks had rallied behind better earnings from market leaders Facebook and Microsoft along with a handful of other names. U.S. stocks and bonds have been mostly climbing in tandem over the last 2-weeks, with stocks touching their best levels of all-time (S&P 500 and Nasdaq Comp new highs this week), while the yield on the benchmark 10-year Treasury note was last at 2.52% Wednesday, its lowest in about two weeks, and back down near 2019 lows. Stocks have been buoyed since the start of the year after the Federal Reserve, led by Chairman Jerome Powell, said it was holding off on further rate hikes after delivering four increases in 2019. In Asian markets, The Nikkei Index gained 107 points to settle at 22,307, the Shanghai Index dropped over -77 points (2.4%) to settle at 3,123, and the Hang Seng Index declined -256 points to finish at 29,549. In Europe, the German DAX is little changed at 12,310, while the FTSE 100 is down around -20 points at7,450. Germany’s 10-year government bond yields turned negative following a string of weak economic data in the country. European banks active after BCS and UBS report quarterly results and Deutsche Bank and Commerzbank officially cancel all merger plans. Supermarket chains Sainsbury’s and the Walmart Inc.-(WMT) owned ASDA decided to drop their merger plans after the U.K.’s Competition and Markets Authority decided to block the deal. The content of this post was created by the Hammerstone Group. The Hammerstone Institutional Forum, a chat-based platform for traders, provides subscribers with up-to-the-minute breaking news headlines and instant analysis that drive the market. For more information please visit www.thehammerstone.com. For more information on the stocks mentioned in the Hammerstone Recap, please contact Brian Ducey at brian@thehammerstone.com. This material is from the Hammerstone Group and is being posted with the Hammerstone Group's permission. The views expressed in this material are solely those of the author and/or the Hammerstone Group and IBKR is not endorsing or recommending any investment or trading discussed in the material. This material is for information only and is not and should not be construed as an offer to sell or the solicitation of an offer to buy any security. To the extent that this material discusses general market activity, industry or sector trends or other broad-based economic or political conditions, it should not be construed as research or investment advice. To the extent that it includes references to specific securities, commodities, currencies, or other instruments, those references do not constitute a recommendation by IBKR to buy, sell or hold such security. This material does not and is not intended to take into account the particular financial conditions, investment objectives or requirements of individual customers. Before acting on this material, you should consider whether it is suitable for your particular circumstances and, as necessary, seek professional advice. Facebook reported first-quarter revenue that was slightly higher than expected on Wednesday, helping the social media giant’s stock rise 8%. Sure, things are getting tougher for Facebook: costs are still rising (up 80% on the same time last year), as the company works to allay privacy concerns and plug data leaks. But that doesn’t seem to be turning people off Facebook, Instagram, or WhatsApp: monthly active users last quarter were up 8% on last year. And that scroller derby helped rake in more money from advertisers seeking to reach users – particularly Generation Z – across their timelines and Stories. Instagram has proved an especially lucrative cash cow for Facebook since its founders unfriended the company last year. For markets: With great power can come great backlash. According to the Wall Street Journal, half of American companies resemble Facebook in having their CEO and chairman be one and the same person. That can streamline decision making – but if Facebook and its money-making ads keep going dark or flirting with record fines for inadequate data protection (Facebook put aside $3 billion last quarter just in case, meaning it made less profit than anticipated), disgruntled investors may try to seize the Iron Throne. Indeed, a group of shareholders is currently pushing to reduce the influence of Facebook founder Mark Zuckerberg’s stake in the company – and to remove him as chairman, à la Tesla. Most companies have beaten investors’ perhaps too-pessimistic outlooks for first-quarter earnings so far, helping push major stock markets to new record highs. Even much-maligned social media rival Snap Inc. posted higher-than-expected quarterly revenue late on Tuesday. But for those falling short of expectations, the punishment is severe: stocks of those companies have dropped 4% on average in the days surrounding their updates, according to FactSet – more than usual for the last five years. Finimize is the daily email that everyone in finance secretly reads. It's the perfect 3-minute cheat sheet on what happened in the financial news: it's free and without any jargon or as Forbes puts it “Super digestible and well-written. A+”. All content is created by the Finimize team, formerly @Goldman Sachs, Barclays, etc. Join more than 200,000 daily readers. This material is from Finimize and is being posted with Finimize's permission. The views expressed in this material are solely those of the author and/or Finimize and IBKR is not endorsing or recommending any investment or trading discussed in the material. This material is not and should not be construed as an offer to sell or the solicitation of an offer to buy any security. To the extent that this material discusses general market activity, industry or sector trends or other broad based economic or political conditions, it should not be construed as research or investment advice. To the extent that it includes references to specific securities, commodities, currencies, or other instruments, those references do not constitute a recommendation to buy, sell or hold such security. This material does not and is not intended to take into account the particular financial conditions, investment objectives or requirements of individual customers. Before acting on this material, you should consider whether it is suitable for your particular circumstances and, as necessary, seek professional advice. Fundamentals: Tech behemoths Microsoft +4.5% and Facebook +9% surged overnight after strong earnings reports. They have single-handedly kept a bid under the broader market, and while the NQ boasts another record high, the S&P is flirting with unchanged. The global landscape speaks a different tone; China’s Shanghai Composite finished down 2.43% today and Hong Kong shed 1%. The Shanghai Composite is now down 4.5% on the week, after China eluded to pulling back the fresh stimulus measures that became a bellwether in driving 24% gains in the first quarter and as much as 33% on the year through April’s high. The MSCI Emerging Market Index, a futures contract that we are active in trading with clients, is down 1.8% on the week and Copper, which we have pounded the tape as a fade-the-rallies trade, is at the lowest level in over a month after losing another 1% today. Again, the global landscape paints a different picture. Speaking of earnings, 3M is down 8% premarket after missing this morning. Comcast and UPS are also in the red. It is after the close that matters most today though; Amazon, Intel and Starbucks report. On the economic calendar, we look to a pivotal read on U.S. Durable Goods, which is accompanied by weekly Jobless Claims at 7:30 am CT.
Technicals: S&P futures have yet to set a new all-time high although the NQ has set a fresh record in four of the last five sessions. The S&P has remained contained below our rare major four-star resistance at ... Please sign up for a Free Trial at Blue Line Futures to view our entire technical outlook and proprietary bias and levels. Fundamentals: Yesterday’s domestic EIA inventory data underwhelmed bullish participants, and price action consolidated lower in a healthy manner. Crude Oil is bouncing back this morning and Brent ripped to a new high, as the broader picture remains upbeat with Iranian supply being stripped from the market by May 2nd. U.S. Dollar strength coupled with global market weakness (China reducing stimulus measures) is certainly holding back what could have already been even higher prices. Durable Goods due at 7:30 am CT brings two sides of the coin; a strong number alludes to firming demand and activity, whereas a miss is negative but should weaken the Dollar. Traders must keep an ear to the ground on the number of developing geopolitical topics ranging from OPEC production and their desire to fill Iran’s void (jawboning from Saudi Arabia, Russia, Nigeria and others), Libya and U.S.-China trade. Technicals: Price action is bouncing back from a new swing low overnight of 65.54. Ultimately, this move held first key support in a very constructive manner, and as Brent rips to a new swing high, WTI is waiting for the onset of U.S. hours in order to confirm the strength. Major three-star resistance at ... Please sign up for a Free Trial at Blue Line Futures to view our entire technical outlook and proprietary bias and levels. Fundamentals: Gold is holding ground ahead of a crucial Durable Goods read but previous lows, now resistance, is keeping a lid on this rally attempt. Overall, it is impressive to see Gold hold such ground while the U.S. Dollar is broadly gaining against its counterparts, and the Dollar Index is trading to the highest level since May 2017. U.S. Treasuries have had a constructive week despite the additional supply hitting the market. Economic weakness from abroad, such as German Climate data yesterday, lit a fire under Bund prices, which correlated into such domestically and thus Gold. Look to today’s data to confirm or deny stabilizing prices in the metal today. Technicals: Price action is out above our pivot level at 1273-1275.5, and this is constructive. However, resistance at ... Please sign up for a Free Trial at Blue Line Futures to view our entire technical outlook and proprietary bias and levels. Visit our website at www.bluelinefutures.com to open an account and stay up to date with our research. Bill Baruch is President and founder of Blue Line Futures. Bill has more than a decade of trading experience. Working with clients he focuses on developing trading strategies that present a clear objective for both long and short-term trading approaches. He believes that in order to properly execute a trading strategy, there must be a well-balanced approach to risk and reward. Prior to Blue Line, Bill was the Chief Market Strategist at iiTRADER which followed running a trade desk at Lind Waldock and MF Global. Bill is a featured expert on CNBC, Bloomberg and the Wall Street Journal as well as other top tier publications. Blue Line Futures is a leading futures and commodities brokerage firm located at the Chicago Board of Trade. We work with clients that range from institutional to professional to novice and from self-directed to broker-assisted. No matter what type of trader you are, our mission is simple; to put the client first. This means bringing YOU strong customer service, consistent and reliable research and state of the art technology. This material is from Blue Line Futures and is being posted with Blue Line Futures’ permission. The views expressed in this material are solely those of the author and/or Blue Line Futures and IBKR is not endorsing or recommending any investment or trading discussed in this material. This material is for information only and is not and should not be construed as an offer to sell or the solicitation of an offer to buy any security. To the extent that this material discusses general market activity, industry or sector trends or other broad-based economic or political conditions, it should not be construed as research or investment advice. To the extent that it includes references to specific securities, commodities, currencies, or other instruments, those references do not constitute a recommendation by IBKR to buy, sell or hold such security. This material does not and is not intended to take into account the particular financial conditions, investment objectives or requirements of individual customers. Before acting on this material, you should consider whether it is suitable for your particular circumstances and, as necessary, seek professional advice. The SPX has struggled to close above the 9/21/18 high @ 2940.91 with our overshoot level @ 3081 above. Top tick @ 2939.75 on 4/23 and 4/24 with the 9/21/18 high @ 2961.25 above. The 20-DMA @ 2894 and ST bullish as it continues to HOLD. A close below 64.62 to make some short-term sales. Top tick @ 27.52 yesterday with the LT .764 level @ 28.37 above. First short-term support @ 26.94, a close below to make some sales. 20-DMA @ 26.67, 200-DMA 26.61, and the 50-DMA @ 26.44 are below. I will advise our first ST support level once the short-term top can be determined. Trading above the 20-DMA @ 2.519 as our very ST selling zone @ 2.562-2.607 is above. NOT looking for a MAJOR move higher at this time. add with a close back above. The Bitcoin Permabulls will continue to shout from the mountain tops this week. A close below the sharply rising 20-DMA @ 5093 to press sales. TRADING IN BITCOIN FUTURES IS ESPECIALLY RISKY AND IS ONLY FOR CLIENTS WITH A HIGH RISK TOLERANCE AND THE FINANCIAL ABILITY TO SUSTAIN LOSSES. More information about the risk of trading Bitcoin products can be found on the IBKR website. If you’re new to bitcoin, or futures in general, download The Beginners Guide to Bitcoin Futures. A member of the Market Technicians Association since 1987, Gary Berman provides institutional clients Technical Analysis Research. He is also an author for the REAL MONEY PRO section of TheStreet.com and TalkMarkets. At THE FIBOCALL we focus on bringing you ACTIONABLE technical analysis research on a daily basis. Everyone should use THE FIBOCALL as a complementary tool to fundamental analysis – a cross check if you will. Our research can be applied on a macro or micro basis. THE FIBOCALL LLC provides custom technical analysis research on equities, ETFs, fixed income and commodities daily. In the electronic world it’s not enough to know the fundamental story on individual equities. You need to know when technicals confirm what the fundamentals say. Please feel free to ask any questions you may have regarding THE FIBOCALL LLC. We offer a 2 week free trial offer so you can determine just how value added THE FIBOCALL can be to you. This material is from THE FIBOCALL and is being posted with THE FIBOCALL’s permission. The views expressed in this material are solely those of the author and/or THE FIBOCALL and IBKR is not endorsing or recommending any investment or trading discussed in the material. This material is not and should not be construed as an offer to sell or the solicitation of an offer to buy any security. To the extent that this material discusses general market activity, industry or sector trends or other broad based economic or political conditions, it should not be construed as research or investment advice. To the extent that it includes references to specific securities, commodities, currencies, or other instruments, those references do not constitute a recommendation to buy, sell or hold such security. This material does not and is not intended to take into account the particular financial conditions, investment objectives or requirements of individual customers. Before acting on this material, you should consider whether it is suitable for your particular circumstances and, as necessary, seek professional advice. 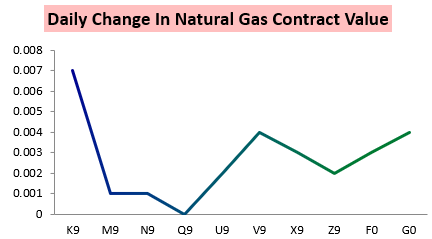 After an early rally that saw May natural gas prices up as much as 3 cents on the day, much of the rally reversed, with the May contract finishing up only 7 ticks on the day. Today, cash prices were the culprit in triggering widespread selling, though Wednesday's cash prints were a little firmer. So, if not cash, then what halted Wednesday's attempt at a rally? It was continued pressure on later-dated contracts, from summer through next winter, which then bled into the front of the curve. The relentless selling in the later-dated contracts has not allowed us to have a true "Spring rally", which has historically been common, making this year a big outlier in recent seasonality trends. 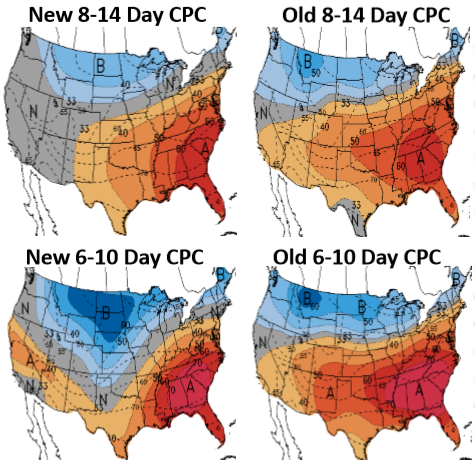 On the weather side, we have seen some colder adjustments in the northern half of the nation, along with some warmer changes in the southern U.S. 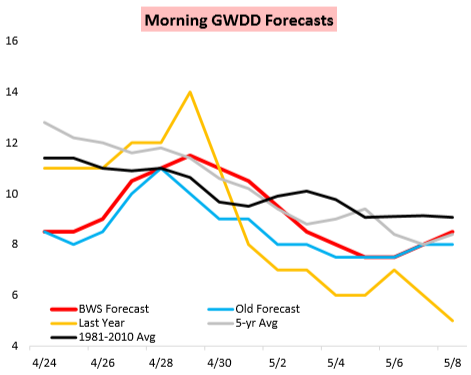 This pattern leads to more heating demand in the north, and some early season cooling demand in the south, boosting GWDD levels back closer to normal for this time of year. 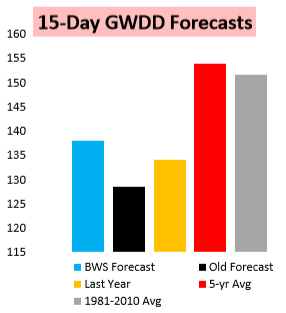 For the first time in several weeks, we also now finally see forecast GWDDs (weather demand) higher than the same dates from last year. Bespoke Weather Services is the premier integrated weather forecasting service for natural gas traders, offering actionable trade ideas and market risk profiles from live weather modeling and pricing data to identify opportunities along the natural gas strip. 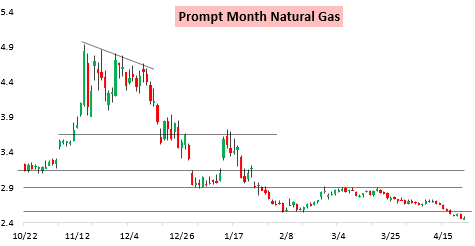 We combine fundamental supply/demand and technical analysis with our weather forecasts to provide numerous research reports through the day alerting traders to what we see driving price action and how risk appears skewed moving forward. We offer market sentiment and analysis on an intraday, daily, weekly, and seasonal basis, providing research packages for both active short-term traders and longer-term investors and portfolio managers. 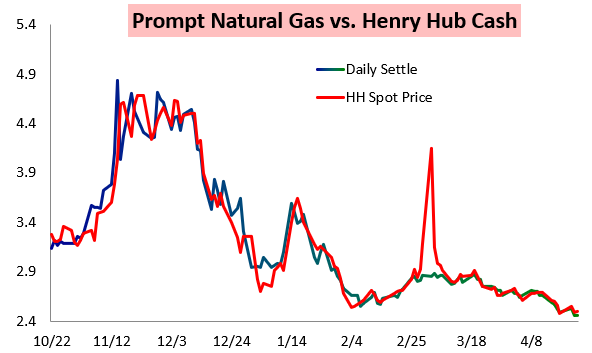 Try a 10-day free trial to our unique integrated weather and natural gas-driven analysis here. Disclaimer: Bespoke Weather Services, LLC believes all information contained in this note to be accurate, but we do not guarantee its accuracy. None of the information in this post or any opinions expressed constitute a solicitation of the purchase or sale of any securities or commodities. This material is from Bespoke Weather Services and is being posted with Bespoke Weather Services's permission. The views expressed in this material are solely those of the author and/or Bespoke Weather Services and IBKR is not endorsing or recommending any investment or trading discussed in the material. This material is not and should not be construed as an offer to sell or the solicitation of an offer to buy any security. To the extent that this material discusses general market activity, industry or sector trends or other broad based economic or political conditions, it should not be construed as research or investment advice. To the extent that it includes references to specific securities, commodities, currencies, or other instruments, those references do not constitute a recommendation to buy, sell or hold such security. This material does not and is not intended to take into account the particular financial conditions, investment objectives or requirements of individual customers. Before acting on this material, you should consider whether it is suitable for your particular circumstances and, as necessary, seek professional advice.